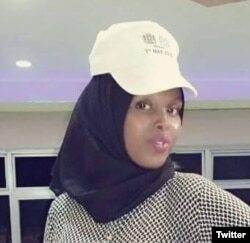 Mohamed Ibrahim Moalimuu, secretary general of the National Union of Somali Journalists, told VOA that Sagal Osman was gunned down by unknown assailants in Hodan District as she was leaving a local university. He said the gunmen fled from the scene immediately. Sagal Salad Osman is seen in an undated photo (via @HarunMaruf @radiomugadisho). No one has claimed the responsibility for Sunday's murder, but journalists in Somalia have been frequently targeted by al-Shabaab.